All students at Augustine receive instruction in music and studio art through their grammar school years. In the upper school they all take on an orchestral instrument, sing in our choir, continue with studio art, and take drama. Music is not an extra-curricular or a “special” at Augustine. Scripture repeatedly calls us to praise God with our voices and instruments; how can we turn development of that skill into an elective? in heaven; let’s start practicing now.” Music gives our students a chance to explore God’s aesthetic and engages their analytic thinking. Our orchestra director, an accomplished musician herself, regularly composes original pieces and rearranges existing works to best suit the abilities of our students. Instruction and practice form the core of music study; performances provide an opportunity to showcase their learning. While few students go on to advanced music study, all graduate having gained competency,and most, proficiency, with their desired instrument. cymbals; praise him with loud crashing cymbals! As Rhetoric students learn to develop their own voice and articulate their own ideas, they practice with drama. Here they speak with boldness and clarity, participating in a story woven by a master narrator, namely Shakespeare. In addition to gaining poise and confidence, they learn Shakespeare: his subtleties, his witticisms, his layers of meaning, his insight into the human condition. As all great stories point to the greatest story–man’s sin and God’s redemptive power–Shakespeare likewise calls the performers and the audience to consider biblical themes. Many parents, students, and friends question why we devote part of our school day to drama and require all students to participate in a Shakespeare production. 1. Shakespeare actually is the curriculum. A part of it at least. And one of the goals of a classical Christian education is to find efficiencies in our studies. So, if performing Shakespeare meets the goal of developing articulate communicators as well as interdisciplinary goals of studying the history and language of the Elizabethan era while also discussing themes that cross boundaries of literature and Bible, it’s a strategic and effective use of our time and energy. 2. We desire to develop articulate, bold, and winsome communicators, and drama undoubtedly develops oratory skills. 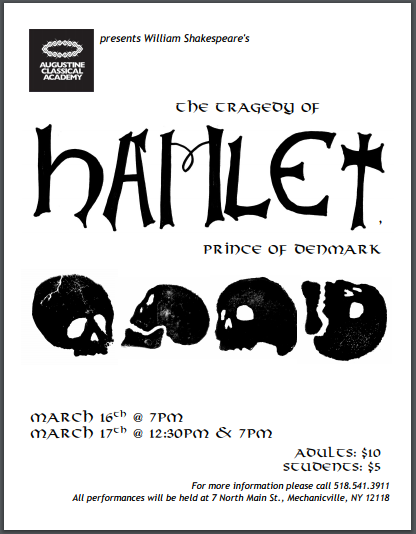 While some may argue that any dramatic production would meet that goal, Shakespeare presents specific challenges for our students that force them to become stronger rhetoricians. Because speaking in Shakespeare’s language is akin to speaking a foreign language today, actors and actresses have to use all the tools at their disposal to convey meaning: tone, volume, enunciation, posture, gestures. They cannot rely solely on the words themselves. To become effective communicators, students must understand that it is not simply what they say but how they say it. That skill is honed in performing Shakespeare. 3. To many, Shakespeare seems inaccessible. Why not select something that would be more entertaining to a broader audience? This question brings us back to our mission as a school. Shakespeare fits with our goals of interdisciplinary study and strong communication skills. Additionally, our Rhetoric Drama program offers programming that causes the audience to consider biblical themes. Through their studies, our students come to understand that good stories point to the Gospel: they show the limitations of human nature and the allure of temptation alongside the incredible power of redemption, forgiveness, mercy, and grace. By placing an audience in an alternate reality for a time, immersing them in situations that appear very different from their own, but, in fact, are common to all people, and then providing a resolution that is consistent with a biblical worldview, we are afforded the opportunity to communicate a piece of the Gospel. Those students passionate about theater may pursue additional performance opportunities on their own time by joining with community theatre groups. We are open to performing other plays by other playwrights, and would consider any that meet these same criteria. However, with Shakespeare we find a remarkable consistency.